This is a first and I loved it. 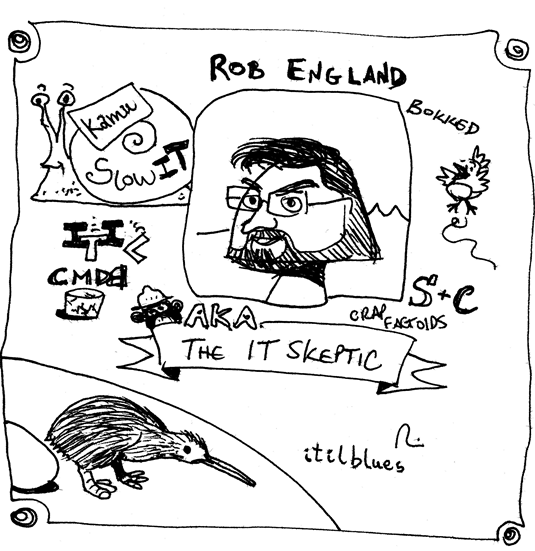 Rob England, the IT Skeptic kindly answered my questions around his latest and truly remarkable Plus! Standard + Case book. 1. Tell me how you ended up with that cover photo of your new book Plus! Standard + Case. I would like to present a case for you: the spine has no title or author, how on Earth will I find your book in my bookshelf? fair question. Printing-on-demand offers less control over the print quality. In particular it’s hard to accurately position the spine, especially on such thin books. I’ll try to get it on there. 2. What is Standard + Case and why do we need this approach? S+C sees the world of response (responding to anything from IT incidents to car accidents) as two parts: the standard stuff we can train people to do in a repeatable manner, and the uncontrolled part which we have to handle each time uniquely. Lots of our ITSM thinking pretends that the whole world is or should be standardised. Especially there is a school of thought that IT can be treated like a manufacturing factory, with CMM, SixSigma, Lean and DevOps leading such thinking. I think that is only half the story. 3. Can you tell me a bit more on how continual improvement works within C+S? “C+S” or “S+C”? because C+S is a special case of S+C – see page 27. CSI for the Standard part of our world is well discussed and documented. Not so much for the Case part. By formalising Case response, we now have policy, methods, and resources which can all be systematically improved. And we have measurement mechanisms to drive and assess that improvement. We review individual Cases to capture learnings. We use those learnings to make improvements. We also use statistics, but less so than in the Standard world, because they are less meaningful when each case is unique. 4. What kind of metrics are relevant when dealing with cases? How should service levels really be agreed? 5. What about certifying Case workers and using gamification? There are no(?) certifications applicable to IT right now. Internal accreditation of case workers is very important however; we shouldn’t hand the badge to just anyone. So we must devise our own schemes to recognise who deserves it. And we always should. An external certification will always only be part of the picture. Gamification seems a good fit to such accreditation. As responders acquire skills, experience and certifications, they “level up” until the top level: case worker. 6. You’ve been defending the Slow IT way to deal with ever faster pace of business. Looks great but how do we actually put it in practice? 7. Now that the word is out, what developments do you foresee for Standard + Case? I’m hoping S+C gets absorbed into the mainstream thinking. e.g I’d like to see the thinking become part of “ITIL 4”, whenever that happens. I’d like to see DevOps, Lean etc make more acknowledgement that much of the world can’t be standardised or automated. I hope the Case Management movement grows, and brings us bodies of knowledge and certifications.